On Thursday evening, I took the 15-20 minute drive to Congleton to try out a new game group: the Congleton & District Light Board Games Club (bit of a mouthful but reasonably good description). This is a new group that have only had a couple of meetings in their current location (previously having been based in Leek). Tonight there were four of us, although they do have a few more attendees and are looking to build up numbers. I took along a few games and we started with Liar’s Dice / Bluff as an easy to explain aperitif. None of the others had played before so, obviously, I suffered from the teacher’s curse and was first to go out (although if I was making excuses, I might suggest I was pushing the bidding up so I could demonstrate the set aside dice/increase bid/reroll mechanism). Anyway, that gave me chance to heckle the others and Barry was next to lose his final die, through no fault of his own as Manny challenged an exact bid by Peter. This led to a sudden death face-off between the final two and Peter was able to outmanoeuvre Manny to take the win. Peter then suggested Stone Age and I was happy with that as it is always good fun, although I was amazed to find I’d not played it for over five years. Peter and Barry both knew the game but it was new to Manny. This game took the rest of the evening, which surprised me a bit, but we were playing a relaxed game. That’s not to say people were going easy on each other and I was a bit shocked when Peter played seven meeples on the forest at one point just to stop me finishing the game. Barry was collecting cards like crazy and it was obvious he was picking up stacks of end game points. Manny was concentrating on huts, although he did also spend quite a bit of time in the love hut, increasing his family to dynastic proportions. I was also grabbing huts but picking off cards that worked well with huts and my harvest production. Eventually the game ended and, sure enough, Barry got about 90 end-game points and looked to be uncatchable. Well, yes he was actually, but I had squirrelled away lots of bonuses myself and ended up just two points behind him, and one more pip on my final dice roll would have given me enough in-game points to take the win. Curses but a very close and hard fought game. Final scores: Barry 184, Garry 182, Manny 150, Peter 137. Thanks to the guys for making me feel welcome – even though they didn’t let me win and I’m hoping this will be a regular Thursday session. Yesterday saw us dig out Fabled Fruit. It was Jan’s first and my second play of this. I really enjoy the simple turns and the prospect of the game developing through multiple plays by introducing new action cards. The game is short so it really is a race with two players to get fruits converted into juice as quickly / efficiently as possible. Jan won 5-4. 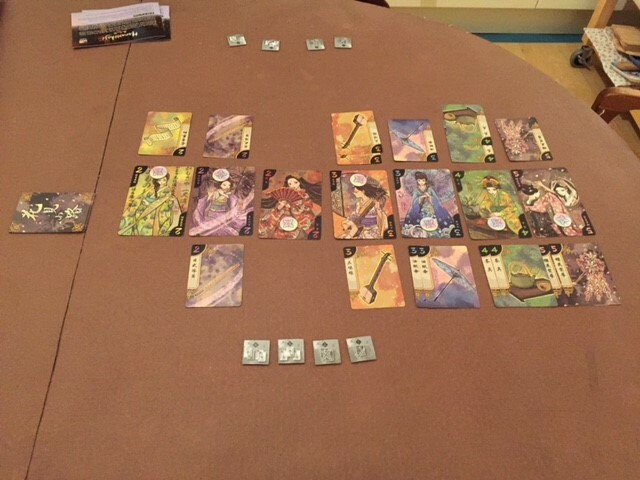 Then today we tried Hanamikoji, which is a great two player card game where you try to gain control of four out of seven geishas or three geishas worth at least 11 points. Each player gets four actions per round after which you check if someone has won. If not, you play another round. Games take between 10 and 30 minutes depending on the number of rounds needed to produce a winner. I finally got my own official copy yesterday and so Jan and I played this evening. The picture below is the end of round two and Jan (the side closest to the camera) takes the win with four geishas on her side, as shown by the round markers. 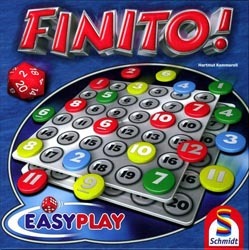 Last night, Jan and I played one of our favourite relaxing games, Finito. It’s a Take It Easy style puzzle game where the roll of a 20 sided die determines where within a 6×6 number grid the players have to place one of their 12 bakelite discs. The discs are numbered 1-12 and once someone has ordered their discs in correct ascending order within the grid, they win the game (or round). Each round takes 5-10 minutes to play so we normally play three rounds counting up each player’s longest sequence of sequential numbers. Jan was on fire tonight and, although we both went out at the same time in the first round, she won both of the other two rounds for a perfect score of 36 (3×12). I only managed 22 (12+5+5). Really fun game for up to 4 players. Author Garry LloydPosted on 5th February 2017 Categories Family gamingLeave a comment on Finished yet? Tonight we played Carcassonne: Star Wars Edition for the first time. I was playing Yoda and the force weak with him was. Jan kept beating me every time I tried to attack her planets (and she had quite a few of them). The final score was close but she triumphed 127-122. The photo is just before final scoring. 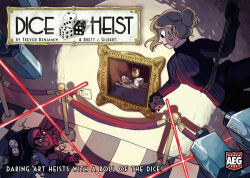 Tonight’s game was the fun dice game, Dice Heist, which we played on our Caribbean cruise last year and Jan won it easily. This time, I turned the tables by pretty much ignoring the paintings and going for gem groups. As a result, I ended up winning 50-38. I also got another delivery today containing Dream Home and First Class: All Aboard the Orient Express. That makes five new games this month already. I need to start playing some more. I received a parcel today containing One Deck Dungeon, The Oracle of Delphi and Dingo’s Dreams. The rules to the last of these are so short that Jan and I tried Dingo’s Dreams this evening. It’s a neat simultaneous puzzle game played on a 5×5 grid, where you reveal animals each turn and then push tiles in your grid (Amazing Labyrinth style) trying to manoeuvre them into a specific configuration. First to do so shouts “Dingo” (or should that be “Bingo”) and wins the game – or round if you’re playing to a certain number of target wins. Very simple and quick but fun for a really short game. Jan won. I also noticed this morning that French online retailer Philibertnet had in the last 24 hours managed to get some more copies of Hanamikoji in stock. I’ve been waiting for this for ages so put in an order for that game, the Oink Games version of Twins and iello’s Time Bomb, which is the French version of Don’t Mess with Cthulhu / Tempel des Schreckens. This is a very nice adventure game for one or two players (although I’ve only played solo) and has a nice story-telling aspect to it. I’ve tried two of the characters so far and you need to play each differently to suit their strengths/weaknesses. I’m looking forward to more plays of this. This is another “roll dice and mark things on a sheet” game but this one works extremely well with decisions becoming more critical as you get closer to the end-game. The solo rules work well and the multi-player version has a modest mean streak where the active player can choose particular dice to deny the others access to them. Really good fun. No surpise here as Basari: Das Kartenspiel is the board game distilled to card game form with very few changes. I really enjoy the board game and this gives exactly the same feel in a more compact package. The additional actions on the extreme cards add an extra element to consider in playing your cards as the actions can really hurt you if played at the wrong time. I like that this ramps up the difficulty while not really changing the gameplay. I’m happy to still play the original rules but this version makes a change from that on occasion. Simple card game of bluffing your way to collecting six different heroes before anyone else. Easy to pick up and good fun as a quick family game. Push your luck dice game where you try to form valid roman numerals from the dice and you bust if you can’t. Short play time but needs to be as non-active players are not involved until it gets to their turn. At higher player counts, the downtime may be too much. I’m a big fan of rummy games and this is another really good example with a Cthulhu theme (although the theme isn’t very strong). I nearly rated this an 8 but the set-up for each round is a bit cumbersome / time-consuming. That said, the gameplay is quick and the two different round-resolution methods makes scoring interesting. Good fun. Nice tile drafting and laying game with tiles displaying one or two of six different landscapes, and groups of connected landscapes scoring based on the number of crowns appearing on that landscape. Another nice family-weight game from Bruno Cathala. I never got to play Absacker (which Freaky is based on) but this is a nice card matching game where you play cards in columns to try and get four to match one of three characteristics and claim the cards in the column. Most cards collected when the deck runs out wins. Very simple and a good relaxing way to spend 15 minutes. The card illustrations are great but I found the gameplay to be very pedestrian, with turn choices being pretty obvious. I have no need to try this again. Another Tiny Epic game and this one turns out to be my least favourite. The gameplay works but I didn’t feel it was very engaging. I might give it another try but I’d probably rather just play Galaxies. I added 3 new games to the collection: The Dunwich Legacy and Curse of the Rougarou expansions to Arkham Horror: The Card Game and Vienna. I also reacquierd one game so my total collection now stands at 565. My list of unplayed games has come down from 28 to 20 and my Game of the Month was Arkham Horror: The Card Game.